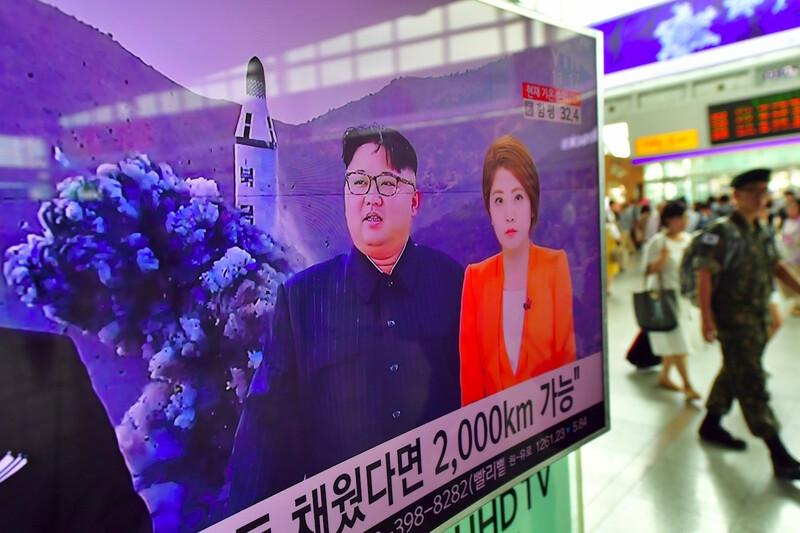 A South Korean soldier (right) walks past a Seoul railway station television reporting news of a North Korean submarine-launched ballistic missile test, August 25, 2016. Pyongyang’s latest provocation, which prompted the United States to deploy THAAD in South Korea, serves as a smokescreen for the United States to further balance China’s increasingly powerful military. Besides shooting down North Korean missiles, THAAD also contains radar technology that would help manage the threat posed by Chinese missiles in a regional conflict. But shouldn’t the United States worry about North Korea? Yes, but it’s much more China’s problem than America’s. Picture North Korea as a robber who pulls out a gun, points it at his own head, and says, “Stop or I’ll shoot.” Surprisingly for many in the United States, the biggest threat that Pyongyang poses is not the extremely unlikely eventuality of a North Korean missile attack on the United States or its allies South Korea and Japan. Rather, the greatest threat Pyongyang poses is that the government, and perhaps even the country, will collapse, leaving other countries to contain the chaos. Besides the North Korean people, it is China, not the United States, that has the most to lose from the collapse of the North Korean state. There are three main reasons: refugees, unification, and American troops. Total state collapse would likely see hundreds of thousands of North Korean refugees fleeing into China, leading to China’s biggest refugee crisis in its history. Moreover, a failed North Korea would likely unify under Seoul, bringing another Western-leaning democracy to China’s border. And finally, Beijing already disapproves of the roughly 28,500 U.S. troops stationed in South Korea. Many influential Chinese thinkers seem to think that Washington views China like the Soviet Union and, as such, schemes for the collapse or the splintering of the ruling Chinese Communist Party. Consequently, Beijing would view American troops on the unified Korean peninsula as a serious provocation. Yes, North Korea’s standing army—estimated at more than 1.2 million soldiers—threatens South Korea, and Japan is a far easier target for its missiles than the United States. That’s why Trump should publicly and privately express support for those two allies. And yes, South Korea would face heavy casualties from a North Korean invasion. But Pyongyang almost certainly knows that invading the South would be suicide. And while Japan’s involvement in rebuilding after a North Korean collapse could be quite limited, depending on the geopolitical situation at the time, South Korea’s involvement would make West Germany’s integration of East Germany seem simple. South Korea’s economy, government, and social fabric would struggle with repatriating North Koreans. But unlike Beijing, Seoul would gain handsomely after the dust settled. Not only would it more than double its territory, increase its population by roughly 50 percent, and gain access to vast unmined deposits of natural resources, but Greater Korea would be linked overland with Eurasia. Correction: An earlier version of this post mis-stated the location of roughly 28,000 U.S. troops. These troops are stationed in South Korea, not North Korea. It’s hard to conclude that the U.S.-South Korean deployment of THAAD is the beginning of anything, and if there is an arms race on in the region it’s hard to conclude it started just recently. THAAD deployment is best seen as an unhappy evolution of an intractable situation. U.S., South Korean, and Japanese officials are likely unhappy that the threat has escalated this far and that THAAD’s defensive capability is far from absolute. Chinese officials are likely unhappy that their expressed alarm and threats of deteriorated ties did not prevent deployment. Perhaps only Kim Jong-un is happy that opposition to his government’s nuclear and missile efforts seems so fruitless. When it comes to the U.S.-China relationship, U.S. officials had publicly and privately made clear to Chinese counterparts that, as the potential threat of North Korea’s nuclear and missile programs increased, the U.S. government would work with its allies to mitigate the risk to U.S. and allied interests—specifically including THAAD. From this perspective, the system’s deployment marks a continuation of U.S. efforts and expressed intentions, resulting from a continually increasing North Korean threat. U.S. experts have argued that THAAD deployment in South Korea would not negatively impact China’s national security, because China’s nuclear deterrent would remain intact and the anti-missile platform would be directed squarely at a North Korean threat. Most Chinese voices, including official sources, have disagreed, arguing as Isaac Stone Fish suggests that THAAD’s radar reach or other capabilities would hurt Chinese national security. Both the U.S. arguments that THAAD doesn’t impact Chinese security, and the Chinese arguments that it seriously endangers China are likely overstating their cases. This reflects another continuity: U.S. and Chinese officials both claiming the other side is responsible for the Korean Peninsula dilemma. In addition to its military dimensions, THAAD deployment had become in part a bargaining chip. The threat (and now actuality) of deployment could be seen as a tool for the U.S. government to pressure Chinese counterparts to take more extreme measures against North Korea. If Chinese officials could somehow coax or coerce Kim Jong-un’s government to become less threatening, the argument goes, the U.S. justification for THAAD would fall away and deployment would be unnecessary. This kind of dealing was never going to work. If U.S. strategists saw THAAD as a bargaining tactic, China’s government effectively nullified it by repeatedly and publicly declaring that THAAD deployment was unacceptable for China’s security, leaving no room to back down. Meanwhile, the U.S. government couldn’t back down without being seen to be rewarding North Korean behavior, making eventual deployment a near certainty unless South Korea disagreed. A recent Chinese decision to ban coal imports from North Korea through the end of the year might have been in part a friendly message to the new U.S. administration. But a coal embargo would not halt North Korea’s tests, and recent tests left the U.S. government looking for responses. With THAAD already on the table and a changing South Korean political scene, officials moved forward when they knew they still could. Each North Korean missile test tries the patience of Japanese defense planners. While these tests seem to demonstrate technical weaknesses, they also reveal the ambitions of the reclusive state. Tokyo has invested heavily in ballistic missile defenses, and continues to work closely with Washington on perfecting the ability to shoot down an incoming missile. Since the end of the Korean War, a possible conflict on the Korean peninsula has motivated Japanese military planning. In the years since the Cold War ended, this has not changed. Pyongyang’s decision to acquire nuclear weapons and to perfect a delivery system capable of carrying a nuclear warhead across continents has only intensified Japan’s military challenges. Japan must now defend against a proliferation of North Korean ballistic missiles, and it has done so by deploying a sea-based Ballistic Missile Defense system, backed up by point defenses for critical state infrastructure. Committed to a defensive posture, Japan’s Self-Defense Forces are well prepared to defend Japan with conventional military operations. But Japan relies on the United States for offensive military reach, and to create a regional security environment favorable to defensive operations. Thus, the U.S.-Republic of Korea (R.O.K.) decision to move forward with the THAAD system is a net benefit for Japan. Tokyo will also follow suit with its own missile defense enhancements, whether THAAD or Aegis-based, in the coming year. But Japan’s missile gap is troubling, and increasingly seen by Tokyo planners as a weakness in the U.S.-Japan deterrent. This perception, of course, is fed by a variety of factors, including the demonstrated improvements in North Korea’s missile program, in Japan’s growing concerns about China’s military intentions, and by the political shift in the U.S. that seems to auger a more complex alliance relationship in the years ahead. The THAAD decision is just one of many moving pieces in the Northeast Asian military balance. Without a doubt, Tokyo will want all of the pieces to continue to ensure a conspicuous effort by Washington to counter any provocation by Pyongyang. But Japan’s planners will also be looking beyond the Korean peninsula, gauging China’s role in shaping the regional military balance. For Tokyo, this decision by Seoul and Washington is as much about U.S. staying power as it is about Pyongyang’s missile launches. Just beyond the horizon, the influence of Beijing looms too large for Tokyo’s comfort. Militarily, Japan has thus far taken a strictly defensive posture even as North Korea’s capabilities have grown, but this has increasingly created a serious gap in Japan’s force posture. In contrast to the U.S.-R.O.K. alliance’s emphasis on missile defenses, expect to see the U.S.-Japan alliance focus on how to integrate some offensive capabilities into Japan’s military posture. The introduction of Terminal High Altitude Area Defense (THAAD) in South Korea was an appropriate and necessary counter-measure to address the growing North Korean missile and nuclear threat, which has been on prime-time display in recent months and weeks. China’s complaints about the system miss a fundamental point: that the deployment is, in large part, a result of the inertia and ineffectiveness that have characterized Beijing’s policies toward North Korea as the Democratic People’s Republic of Korea’s security behavior has heightened instability for other countries in the region. The disagreement between the U.S. and China over THAAD hinges on the charge, leveled by Beijing, that THAAD (and in particular the X-band radar capabilities that the system employs) will negatively impact China’s security. That remains open to debate—the system is primarily designed to intercept missiles as they descend on Korea, contains no warheads or offensive capabilities, and even the radar systems duplicate warning capabilities that the U.S. military and intelligence community already possess. But even if there are negative side effects on China’s security, Beijing must recognize that its own efforts to rein in North Korea’s weapons development, including economic measures such as limiting coal purchases from Pyongyang, have been ineffective at halting the growing threat to South Korea, Japan, and the United States. Sanctions and dialogue—the other options available, with dialogue always being Beijing’s proposed solution—are long-term tools; while these are debated and applied, the U.S. and its allies must take short-term measures to mitigate the immediate danger. Moreover, even with THAAD, significant vulnerabilities remain for the United States and its allies. THAAD does not cover Seoul, still vulnerable to North Korean artillery positioned just miles to the north, and Japan’s missile defense systems could be over-saturated by a simultaneous launch of multiple missiles, which is what North Korea looks to be aiming to do. THAAD also does not address the very real risk of horizontal proliferation—the sale of missile and nuclear technology to other countries, as North Korea has sold other weapons systems in the past—or the risk that these technologies could be used in some kind of unconventional attack of the type witnessed in Kuala Lampur. It is, in short, an incremental improvement and a partial solution to the North Korean threat. The biggest questions about THAAD probably come at present from South Korea’s domestic politics. With today’s impeachment of President Park, South Korea is likely to have a left-leaning president, and Moon Jae-in, the current front-runner, has previously suggested that he might reconsider the system (though he now says he supports the deployment). The THAAD system that arrived last week is currently at Osan, waiting for the ultimate site of the system to be prepared, and full deployment is not expected until June, after the new president takes office. The future of THAAD, therefore, is not yet assured, let alone any secondary spending decisions or deployments that might result. It looks most likely that THAAD deployment will move ahead as scheduled and that Tokyo will also look at how to expand its missile defense capabilities. If that’s an arms race, responsibility for it lies squarely with Pyongyang. The decision now facing Beijing is whether to recognize the increasing strategic liability that its inertia vis-à-vis North Korea poses. With their security at stake, other countries are unlikely to stand still simply because Beijing wants them to, and economic punishment may no longer be sufficient to deter them from taking action to protect themselves. Rather than trying to shift the costs of its inaction to others, Beijing should be asking when the costs of passivity become too high, and what other options it is willing to consider—if for no other reason than to cut its own losses.